By 1954 the Electorial Register shows Rupert Musgrove and his wife Rene living at 1 Oxford Road, off Hampton Road Teddington. The property is shown present day above (top left). We assume they moved here after their short spell in Seaford East Sussex. By 1956 the Electoral Register shows Rupert Musgrove and his wife Rene living at 49 Lower Teddington Road Hampton Wick. The couple lived in a flat at this address until about 1959. The property is shown present day above (top right). 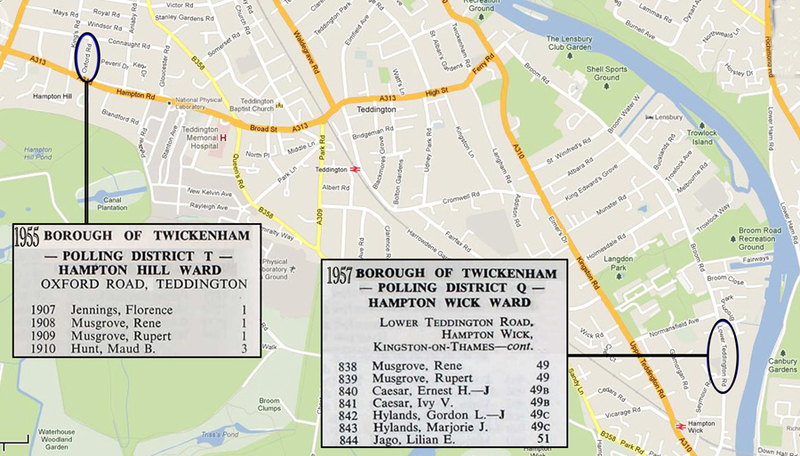 The map below shows the locations of both addresses with copies of each Electoral Register.